What if Planet Earth Could Talk To Us Cartoon! 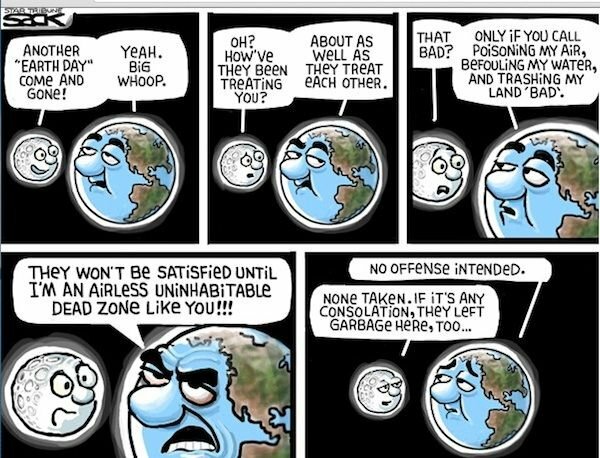 Although this cartoon gives me a chuckle, It portrays mankind as the problem for Earth&apos;s pollution. This is not true! Chemtrails and other pollutants come from the Annunakki Illuminatti working through humans to pollute our skies, land and water. Why do they do this? Because we who are in human form are of no consequence to them. They want to change our environment into a Reptilian Environment so that it is more comfortable to them. We of Earth are like "fresh water fish" and we need fresh water in which to thrive. The native environment for Reptiles and swampy bottom feeder fish is Swampy water. Which are you?